Deepawali, also known (in the North) as Diwali or the Festival of Lights, is celebrated on the first new moon in this changing-from-fall-to-winter season. This is one of many things I like about India--they follow the lunar calendar and pay attention to the moon. 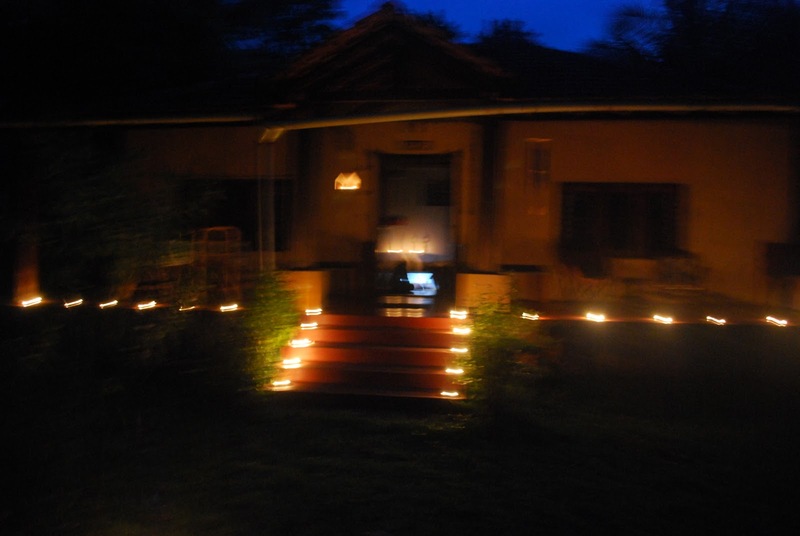 For Deepawali, people give each other gifts, though it's not as central as it is for Christmas. More important is the lighting of lamps and the prayers--to Ganesh, the elephant-headed remover of obstacles, to the gods of your house and family. People dress nice, cook and eat special meals and sweets. It is a family holiday. Sunita has bought me a sari for a Deepawali present and I wear it. Some friends from the Isha Yoga Center have come, Lakshman (an ex-Navy man who now practices agriculture, teaching and yoga with missionary zeal, particularly for a certain soil-building technique called Amrit Mitti, "Nectar Soil") his quiet wife Sujatha, and their fourteen-year-old son Anugraha (which means, "blessing.") 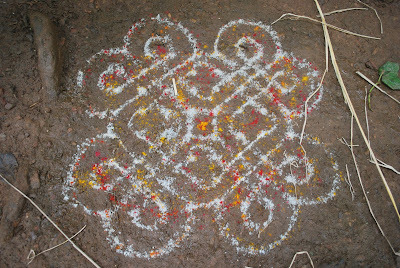 Anugraha goes to Gurukula school, the ancient Indian form of education. With other young men and women, he is under the teaching of a certain guru. They learn Sanskrit, English, Tamil, yoga and meditation, Karnatic classical music (singing/chanting) martial arts, and dance. Also somewhere in there they learn math and standard language arts, and Anugraha knows a fair amount about biology as well. The guru is also entrusted with educating his students about the things you learn from your parents: ethics and in general how to live well. You should see this guy. He looks like an Indian prince out of the Mahabharata, with his long hair and kurta and dhoti, but most of all it's the way he carries himself. I sort of forget he is fourteen--he acts more mature than most college boys. He is very disciplined in his meditation and talks like an adult, articulate as anyone. But it's not like his childhood has been sacrificed either--he loves to play Uno, and crows more gleefully than my brother when he wins. But here's where the secret brilliance of this Gurukula system comes in. Who listens to their parents at 14? I know I tried to be exactly the opposite (and then found myself behaving like other people that I wanted nothing to do with, and learned the important lesson that you can't be the opposite of everything, and you can't be anything but yourself.) I have long thought that adolescence could be such a powerful age if adolescent kids weren't so absorbed in petty power struggles with their parents and petty social struggles with their classmates. If they had somewhere to direct all that change happening in minds and hearts. This kid is what I wish I had been like at 14: gracefully, on his own terms, growing from a child into a man. Independence is taken care of--he lives with other students in a hostel--but responsibility is now to his Guru and his studies. I'd like to meet the girls in his class. Anyway. Besides friends and family, also integral to Deepawali is the Go-puja, where cows are thanked for all they provide: the daily eaten yogurt, ghee, milk, and other milk products as well as essential dung and urine for fertilizers. All morning bells have rung for this puja; at about noon we go to the cow-shed. 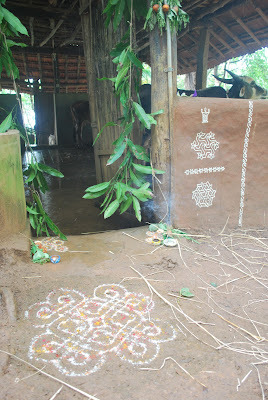 The cow-shed has been decorated the night before. 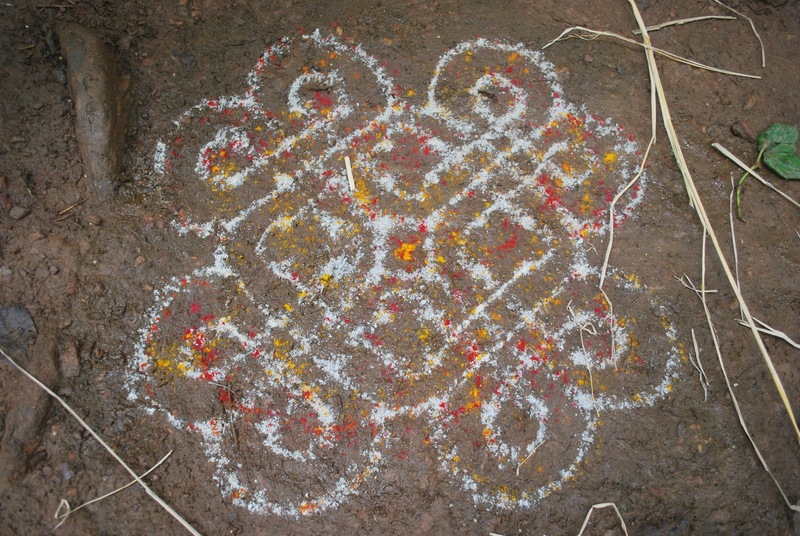 Savitri has drawn a beautiful rangoli, with kumkum and turmeric colors, at the door. ...and a neighbor, Vinoudaka, has come over to do the paintings on the cowshed walls. First she made dots, then connected them into beautiful symmetry. 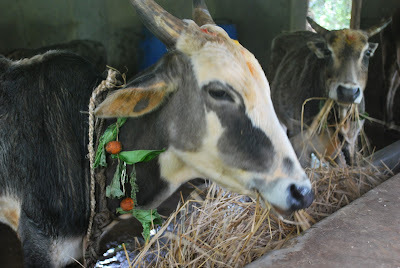 The cows, before their hay, are given dosa (like a crepe) with turmeric added, and also some paysa, a sweet like rice pudding but made with vermicelli noodles and milk and sugar, that has been blessed. 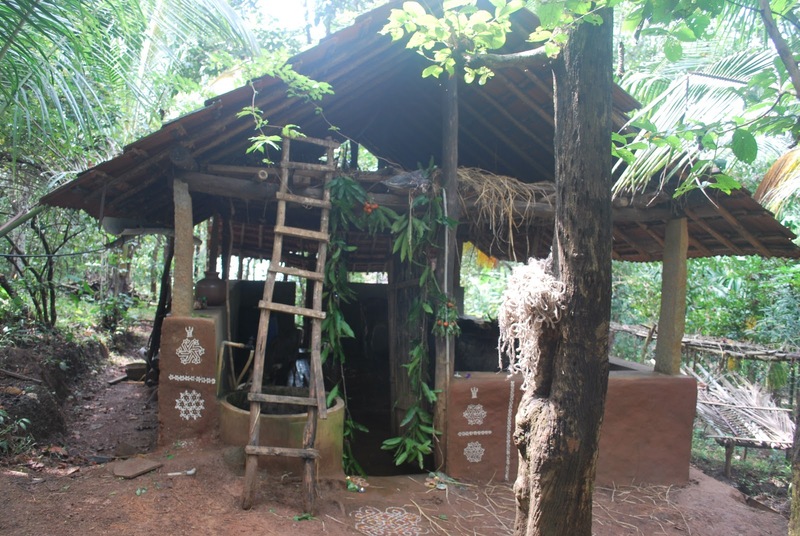 They have also been given these necklaces of mango leaves and areca nuts, and have had kumkum and turmeric rubbed on their foreheads (Manju and Sunita had to dodge their horns to do this! They did not like it.) Flowers are placed at their feet; touching the feet of something is a sign of utmost respect and reverence. 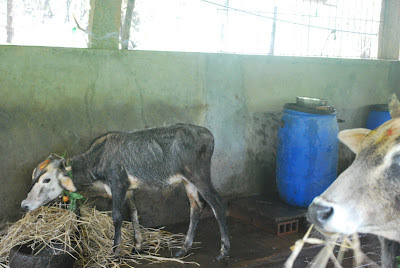 The calf is called Guru. This is Gauri, also named for a goddess. Now I want you to look at something. 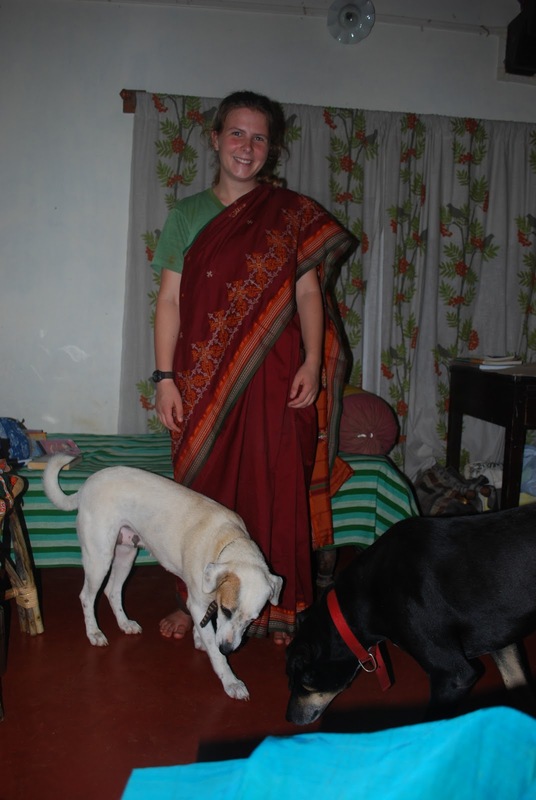 Look at Balarama, and then look at Gauri. Do you notice a difference in their bodies? That Gauri's ribs show much more and her hip bones jut out? It's extremely evident when you see them side by side. 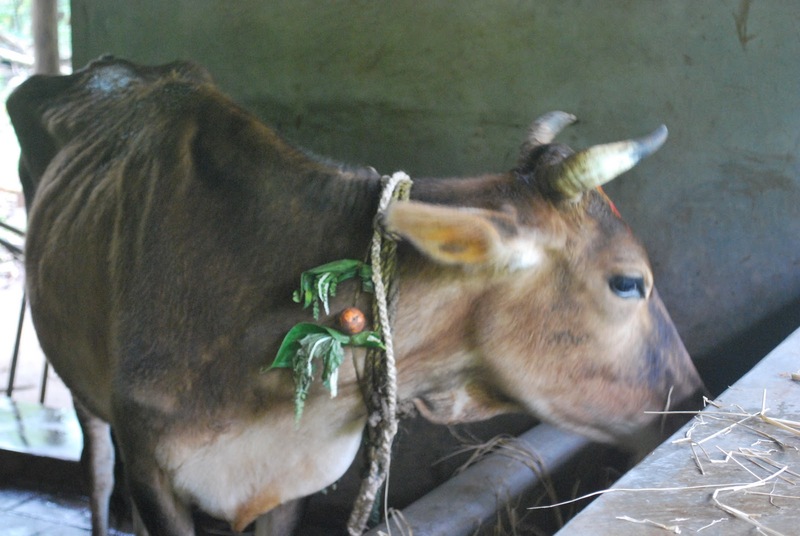 Gauri is giving milk, which is one possible reason. 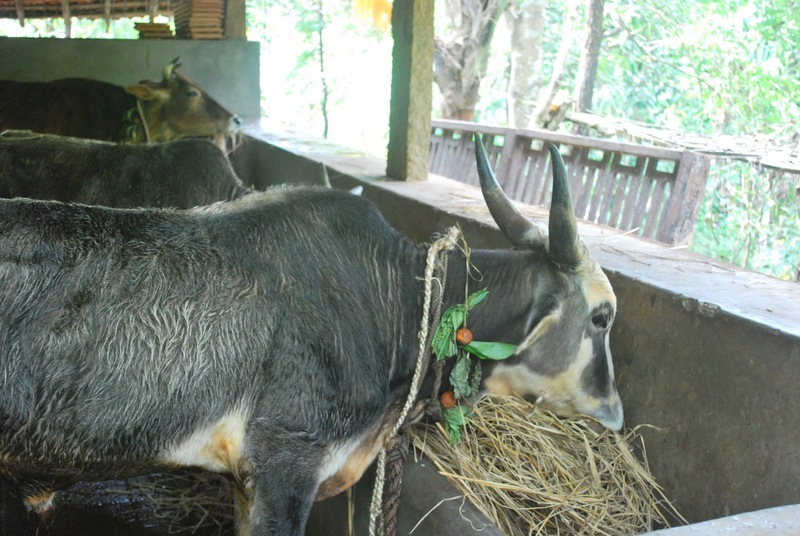 However, she is given three times as much cattle feed as the other cows, and still she is thin like this. Gauri is half Jersey, and thus needs more food because Jerseys have been bred to be high input, high yield cows. The work Vanastree is doing--promomoting locally adapted varieties--is applicable even to livestock. And it has serious implications for farmers--what are you going to do with a ranch of Jerseys if your grazing land is forest, and you cannot afford the volume of cattle feed that your cattle need? Then at night, we light lamps and put them at all the entrances to the house, and the round hut, and Manju and Savitri's house. When you place a lamp, you think of someone (or many people, as I had to with so many friends far away!) who is not here. This is my favorite kind of meditation, of little magic. 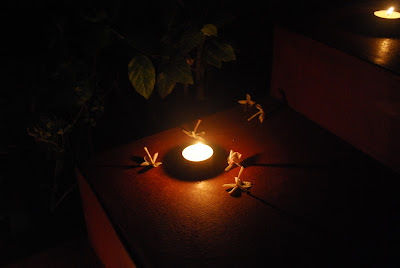 Flowers and fire, two very important parts of puja. Where did the three months go?